9.15 - 9.30 │ Patricia THIBAULT (Pôle Mer Bretagne Atlantique) Industrial and applied research : collaborative projects in Bretagne and Pays de Loire. A birds-eye view of local marine bioresource projects on-going in the North-West of France. 9.30 - 9.45 │ Gaëtan BURGAUD (Université Bretagne Occidentale) Fungi is the latest group of organisms to stir the interest of biotech companies. We take a look at what is going on in the world of academic research in Brittany and Pays de la Loire to provide the private sector with a better understanding of the potential of marine mushrooms. 9.45 - 10.00 │ Christine DELBARRE-LADRAT (IFREMER Nantes) Marine bacteria are well known to the private sector and have in recent years been the source of many new marine-derived products. Here we look at what is going on in the region, with a special focus on one of the leading laboratories on marine bacteria in the region. 10.00 - 10.15 │ Régis BARON (IFREMER Nantes) Microalgae have huge diversity and therefore enormous potential for biotechnology, from cosmetics and biomedical application, to novel food systems future fuels. Here, IFREMER will give an insight to what is happening on the territory and particularly at their sight in Nantes. 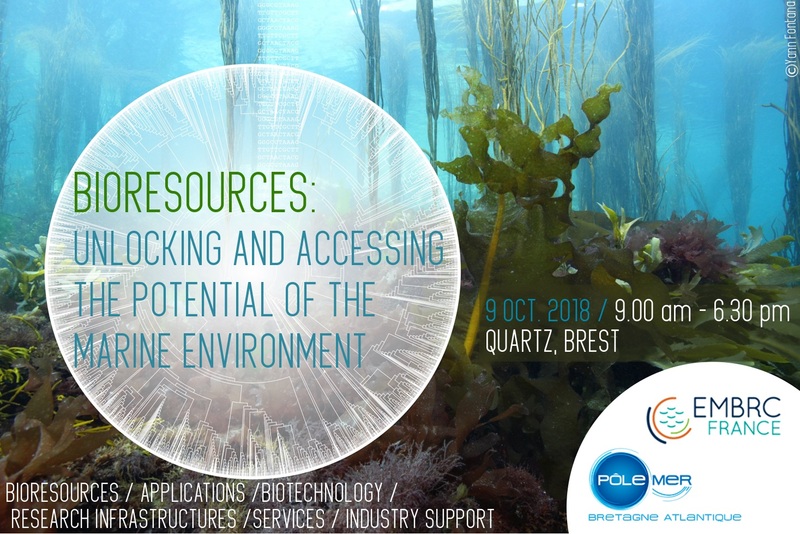 10.15 - 10.30 │ Philippe POTIN (Station Biologique de Roscoff) Macroalgae is one of the most important biological resources coming from the sea in the French North-West and a major source of projects and investment both from the public and private sectors. Philippe will provide insight to cutting edge research currently going on in Brittany and Pays de la Loire, demonstrating how public private partnerships are leading the way, and that industrial research can still be fundamental in nature. 11.00 - 10.30 │ Steinar BERGSETH (Research Council of Norway Division for Innovation) Bioresources in Norway: trends and frontiers. This is an opportunity for Norway to show-case what the main areas of interest are in Norway in terms of marine bioresources and stimulate discussion over the Sea Tech Week for areas of collaboration and potential new markets. 11.30 - 12.00 │ Nadia AMEZIANE (MNHN Concarneau) Biodiversity observation and ecosystemic services. Our seas are not just sources of novel products and biotechnological inspiration, they are first and foremost essential components in our existence, regulating our climate and providing vital food sources. We must therefore not forget the enormous value of these “ecosystem services” and how to valorize the seas beyond the obvious short-term monetary benefits. 3.00 - 3.20 │ Isabelle DIAZ (Ministère de l’Enseignement Supérieur, de la Recherche et de l’Innovation) Research infrastructures and dedicated services in France. Research infrastructures are new concepts for both academics and private companies. Here, the French ministry of higher education, research and innovation will present their vision of the future of research and how research infrastructures are at the heart of pushing research frontiers in the future. 3.20 - 3.35 │ Nicolas PADE (European Marine Biological Resources Center - France) EMBRC-France, a research infrastructure for marine biological science and innovation in France and across Europe. EMBRC is the research infrastructure dedicated to marine biological resources with three sites across France, including one in Brittany, and will present it services and how they can be a strong partner in pushing academic and R&D projects forward. 3.35 - 3.50 │ Pierre COLAS (INSERM – Station Biologique de Roscoff) EMBRC-France commitment for marine biological industry sector. A look at the current industrial relations of EMBRC-France and the opportunities offered for companies on the three French sites, to show-case how an RI can support companies in the region and further afield. 3.50 - 4.10 │ Cristina SECADES (University of Vigo) EMBRC Blue Biobank project: how to facilitate access to marine biological resources. Accessing bioresources has become highly regulated and now requires very specific permits and steps to obtain them and to ensure that any benefits derived from them are shared with the country of origin. The EEB project is working to ensure that EMBRC can supply bioresources in line with current legislation, and develop best practices and guidelines for the public and private sectors. 4.30 - 4.45 │Romain CANCOUET (Euro-Argo ERIC Brest) Euro-Argo is the European component of the international Argo programme, a network of oceanographic profilers across the world’s oceans. It offers access to a suite of data and data products and will demonstrate their application and how they can support local research and innovation. 4.45 - 5.00 │ Patrick FARCY (IFREMER Brest) Jerico-Next, as the European coastal observatory network, brings together all the major players in Europe. It is developing a host of services and products of interest to all who work near or in the sea. Here they will provide an overview of their activities and how they may benefit users of marine bioresources. 5.00 - 5.15 │ Helene LEAU et Pierre-Marie SARRADIN (IFREMER Brest) EMSO is the European subsea observatory infrastructure, with a strong presence in Brittany. Here they will present the last of the European marine research infrastructures and the opportunities and services they have to offer to research and innovation. 5.15 - 6.00 │ Philippe POTIN (Station Biologique de Roscoff), Pi NYVALL (OLMIX), Rachel PORTAL-SELLIN (Pôle Mer Bretagne Atlantique), Isabelle DIAZ (MESRI), Nicolas PADE (EMBRC-FR), Philippe ROY (Phosphotech), moderator Pierre COLAS (Station Biologique de Roscoff). Exploring and improving collaborations between fundamental research and industry will be the heart of this discussion. Marine biotechnology sector growth and optimization of its potential exploitation relies on cooperation with fundamental research. Invited speakers will give insights on this interconnectivity from different perspectives : academic researcher, industrial researcher, policy maker, research infrastructure as support tools to marine biology innovation, and maritime cluster, as a catalyst for innovative and collaborative projects.